Today, December 17, 2003, is the 100th anniversary of one of man's most historic events. This day in 1903, the Wright Brothers became the first humans to successfully fly into the air on a man-made controllable aircraft. Why am I paying tribute to this event on the Monorail Society website? One of the interesting side notes of this important event happens to be that the Wright Flyer traveled down a monorail before it took to the air! 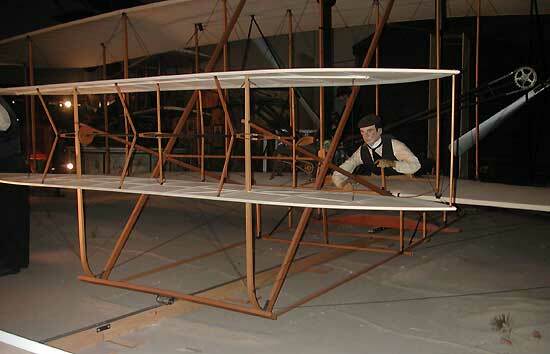 Pictured here is a replica of the Flyer located at the San Diego Aerospace Museum. Look closely and you can see the single rail that the Wright Brothers used to launch their airplane. The wheel in the front stayed with the aircraft into the air, but the rear wheels were part of a small sled that remained earthbound. A closer look at one of the lesser-known monorails. 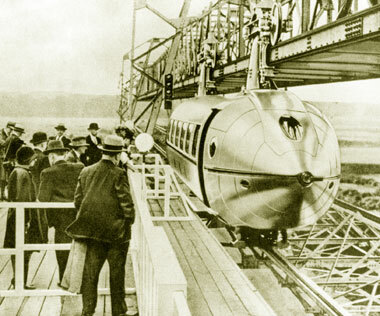 Monorails have been around longer than airplanes, but in the last 100 years there have been many links between the two. In1929 in Scotland, George Bennie's Railplane was obviously an attempt at duplicating aviation speeds on rail. Besides having an aerodynamic plane-like body, thrust came from electrically-powered propellers at the front and back of the test vehicle. A Railplane test track was successfully demonstrated, but the system never took off (pun intended). Other airplane-like monorails were proposed throughout the years, but perhaps the most famous monorail with an aviation look was the original Disneyland-Alweg Monorail. Designer Bob Gurr was inspired by the Flash Gordon rocket ship when he designed the Mark I. The Mark I featured aluminum side panels, a pilot "bubble," and a sleek nose that reflected the new jet age in 1959. 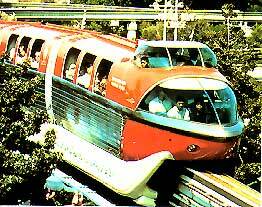 This image is of the Mark II, the second generation Disneyland-Alweg Monorail.